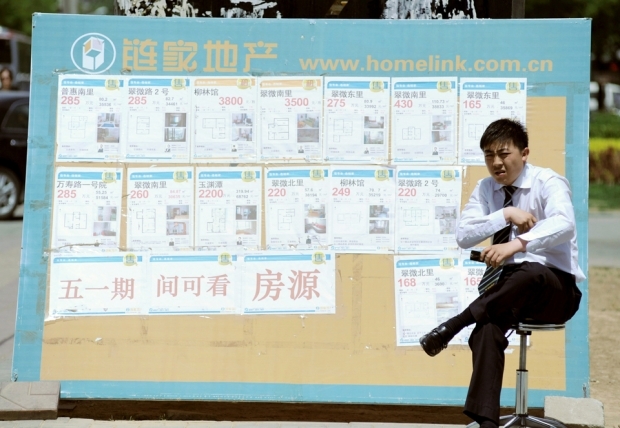 An agent sits in front of a board posting various property sales on a street in Beijing. China’s food and housing costs, which include utilities and rent, have outpaced overall inflation, soaring 11 percent and 6.5 percent respectively in the first quarter of 2012, increasing pressure on households already battling to make ends meet. They smoke, chat, and lean against motorbikes pulled onto residential sidewalks, forcing pedestrians to walk around their little gangs. The men wear white shirts and ties, the women white blouses and skirts. Each is eager to cut a deal. They are real estate intermediaries known as “zhongjie,” and every day they fish on China’s sidewalks for home buyers, tenants, and landlord clients. Their looming presence is a constant reminder that real estate is at the heart of the Main Street economy in Chinese cities. Zhongjie made a lot of money dealing in home sales before the government cooled the market more than two years ago. Now they are busy cutting deals with landlords and tenants, and collecting a fee equal to one month’s rent for each lease. The following story sheds light on why they can afford to lounge on street corners. A twenty-six-year-old woman who moved to Beijing from a distant town for work could be a poster child for urban China’s latest housing market phenomenon: skyrocketing rents. The woman, surnamed Fang, said goodbye to Liaoning province three years ago for a job that paid 2,400 yuan monthly and a one-room basement apartment on the Third Ring Road shared with a workmate that cost her 600 yuan a month. In June, a Beijing government safety campaign that emptied basement apartments forced Fang to move. Now, she’s paying 50 percent more for a flat that’s ninety minutes farther from her job and outside the Fifth Ring Road. Since early last year, average rents have been rising about 10 percent a year in major cities monitored by the China Index Academy, a property research organization, said academy real estate analyst He Tian. The growth rate “in a lot of cities” suddenly accelerated in the first half of this year to more than 10 percent compared with the end of 2011, He said. Rents in Shenzhen, Chengdu, Tianjin and Beijing jumped as high as 14 percent during the period. Analysts blame the explosive increase in part on central government housing policies, including a rule in place since 2008 that bars anyone without a local residency permit, including newcomers such as Fang, from buying homes in cities such as Beijing and Shanghai. “There are a lot of willing buyers who don’t qualify” for purchases “and have to rent,” said a Beijing real estate agent with 5i5j Group. Consumer price inflation, rising wages, and demographics have contributed to rising prices tied to higher demand for apartments in growing cities such as Beijing, where according to the Chinese Academy of Social Sciences an average 700,000 people have settled for work after abandoning other parts of the country every year since 2000. Slower-than-expected progress for a central government campaign to build subsidized housing across the country, partly because of funding shortages, has been cited as another reason for a housing shortage behind rising rents. In the nation’s capital, based on data from the Beijing Municipal Construction Committee, only 834,000 square meters of subsidized housing, or roughly 14,000 units if each one occupies 60 square meters, were completed in 2011. Su Ri, a senior analyst at Century Real Estate, said rental flat demand will exceed supply and keep prices high in cities such as Beijing over the long-term. An analyst for the real estate firm Home Link, Zhang Xu, said he expects Beijing rents to continue climbing for the next few years. Moreover, several landlords who own multiple units told Caixin their decisions to raise rents were based on market estimates they got from real estate agents. Central government real estate policies to date have generally focused on home buying controls without giving much attention to the rental market, said Zhu Haibin, chief China economist at the investment bank J.P. Morgan. While the controls have remained unchanged, recent cuts to benchmark interest rates by the central bank stoked market expectations for fresh increases in new-home prices. Also fueling expectations were recent land auctions by the governments of Beijing and Tianjin that drew sky-high prices. Local governments have tried to shore up slumping real estate sales, too, since land auctions are among their most important fiscal revenue sources. In some parts of the country, city governments have tried overriding central government controls in recent months by introducing their own, more relaxed market restrictions. Yet none of these policy developments have had much impact on city rental markets. Neither has the government’s push to build more subsidized apartments affected rental demand, according to Home Link research. Most renters simply have no choice but to rely on the general supply available through landlords. Zhu has recommended the government adjust its real estate policy in ways that benefit renters. One way could be to encourage the owners of empty apartments, such as real estate speculators, to open their flats to tenants. The Home Link report said owners of some unoccupied apartments don’t want renters and are keeping them vacant in hopes the government’s house-price controls will be lifted soon, giving them a green light to sell at a hefty profit. “How to convert vacant housing in the market into an effective supply for the rental market is still something that should be considered” by policymakers, Zhu said. Meanwhile, renters such as Fang have been forced to move farther from city centers in search of affordable housing. Flats near subway stations in Beijing, for example, command higher prices than those in distant apartment complexes. Some tenants have, rather than move, simply caved in to their landlords’ demands for more money. “If we tried to find a new home,” said a Beijing tenant who shares a 2,400-yuan-a-month flat with two other single adults, “we’d have to pay another month’s rent to a real estate agent. Zhang Huanyu is a Caixin staff reporter.